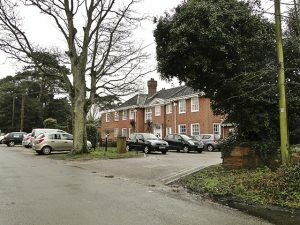 Aldeburgh Community Hospital is set in parkland on the outskirts of the town. It includes an inpatient unit with 20 beds offering short-term care and rehabilitation, with the aim of helping people to return home if possible, or to be supported in making alternative plans such as residential care. The hospital also has a Day Centre, outpatient physiotherapy, x-ray and renal dialysis. Aldeburgh Hospital includes an inpatient unit, with beds for patient who need rehabilitation and management of long-term conditions. The ward is overseen by a modern matron, with a team of nurses, therapists, generic workers as well as domestic staff. The hospital also offers clinics provided by its own staff and in partnership with other organisations. Aldeburgh Community Hospital 2011. © Adrian S Pye. Licensed for re-use under a Creative Commons Licence.